Even though futures trading represents only a small component of the overall currency market (most currency transactions are over the counter), the CFTC Commitment of Traders Report gives a good indication of speculative position buildup. And as before, the short euro trade continues to be the bet of choice. 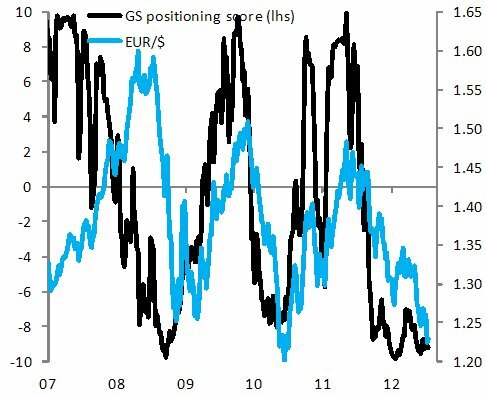 GS: - EUR net shorts rose yet again to -$25.7 bn from -$25.4 bn last week and our positioning score moved from -9.1 last week to -9.2 this week, indicating slightly larger EUR net shorts once adjusting for open interest and the rate differential. The Goldman's positioning score is an indicator of how "crowded" this trade is. Clearly the fundamentals are in favor of betting against the euro. But one has to be careful of the technicals, as the reversal of this trade could become quite violent.